Earlier in the summer we produced this large plaque for a new museum in Malta which commemorates the history of the postal service in Malta, which can be dated back to the 16th century. 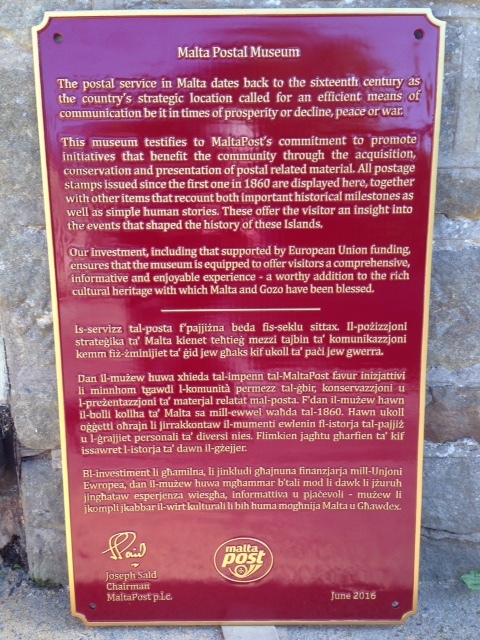 The plaque features a lot of text in both English and Maltese as well as a signature graphic and corporate logo. The sign was cast in alumninium and finished in vibrant red and gold paint. The plaque is wall-mounted on the exterior of the museum building. We used our in-house CNC router to cut out the pattern for the casting mould - placing the text by hand would have taken days of painstaking work, especially as our knowledge of Maltese is non-existent! It was great to work on a plaque project for an international customer - testament to the quality we strive for here at Croft Cast Signs.